Simple clean lines were sewn into this soft, lightweight T-shirt with a fluted, wide hemline that billows softly around your hips. The round neckline is trimmed with matching black that is used on the long sleeves. Simple seams on the sides and one in the rear of the garment wears well, has excellent drape and is easy to care for. The wide hem keeps its shape with a double row of topstitching in matching beige fabric. Wear this great garment over a pair of tight jeans and black boots. 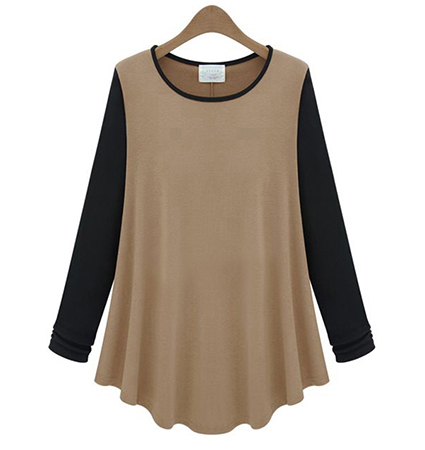 Small size; bust 88 cm, sleeve length 51 cm, shoulder 37 cm, overall length 61 cm.